The main factor when harvesting cucumbers is size. So how big should the cucumbers get before they are ready to be picked? That depends on the variety of cucumber and how you intend to use them. Pickling cucumbers should be harvested when they are 3-5 inches long. Slicing cucumbers are a different story and are usually harvested when they are 6-9 inches long. However, they can be harvested earlier if you so desire. The earlier the cucumbers are harvested, the smaller and more tender the seeds will be. 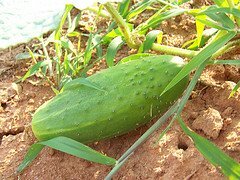 Most folks prefer more flesh than seeds when eating cucumbers, so consider harvesting earlier rather than later. A cucumber that is yellow in color is usually over-ripe and will be bitter. Even lemon cucumbers should be harvested just before they turn completely yellow. Before adding cucumbers to a salad or other recipe, it's a good idea to taste a tiny portion to make sure that the fruit is acceptable for consumption. Like many other vegetable plants in your garden, the more cucumbers you harvest, the more cucumbers the plant will produce. During peak production, it's a good idea to check the vines on a daily basis because cucumbers tend to grow quickly. You may see a 3 inch cucumber one day and find that it is 5-6 inches long the following day. 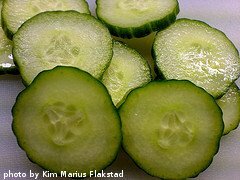 When harvesting cucumbers, use a knife or shears to cut the stem above the fruit. Avoid pulling on the cucumbers because the vines tend to be slightly brittle and break easily. About a month before the first expected frost in your area, it's a good idea to pinch off any remaining blossoms on your cucumber plants. This encourages the remaining fruits to mature more quickly before the cold weather kills them. After harvesting cucumbers, wash off any dirt and use them as soon as possible. If needed, cucumbers will keep up to 7-9 days in your refrigerator. 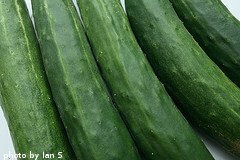 Home grown cucumbers usually don't keep as long as commercially grown cucumbers. Store bought cucumbers are usually waxed to prevent moisture loss. Cucumbers from your garden will keep better if you wrap them in plastic wrap or place them in a sealed zipper bag before placing them in the refrigerator. This will prevent them from drying out. Cucumbers don't freeze well because of their high water content. If you want to store your cucumbers for much longer than a week, pickling them is really your only option. When most folks think about eating cucumbers, pickles and sliced, raw cucumbers come to mind. You may be surprised to learn that there are many other recipes that feature cucumbers.